In an era when house music is largely been dominated by continental names, it's refreshing to see a British talent shine through and gain the global acclaim they so very deserve. Anil Chawla is exactly that - a homegrown star whose steady rise has been all about quietly consistent quality, not flavour-of-the-month hype. There was no quick and easy break for Anil - just a steady stream of ear-catching, high-quality house music demos passed around London's promoters, and a subsequent booking at the legendary Turnmills (R.I.P.) That booking led on to a residency at the acclaimed Together nights - where he had the both envious and unenvious task of warming up for electronic music royalty as diverse as The Chemical Brothers, Fatboy Slim, Francois K, Trentemoller, Josh Wink, Green Velvet, Simian Mobile Disco, Mylo, Hot Chip, MSTRKRFT, and Cassius. He calls it his "apprenticeship" - and indeed it proved invaluable experience, these high-profile warm-up sets bolstering his ever-growing peak time appearances elsewhere. Dance music bastions Global Underground soon picked up on his skill across the board and his early productions on labels like Duty Free and Twisted Frequency, and began their ongoing relationship with him by releasing a series of singles and remixes, and more recently a weekly GU show on Ministry of Sound Radio (with fellow compadres, Dale Anderson and Jim Rivers). A global fanbase was soon established, and guest mixes on John Digweed and Tall Paul's KissFM followed, his DJ profile growing simultaneously with his ever increasing status as a producer, with releases on leading labels like Cr2 and Nic Fanciulli's Saved Records. His peak thus far as a producer came in February 2009 with the release of his debut album alongside frequent studio partner Dale Anderson, the stunning Roadhouse, released on Global Underground. A sublime album of house and techno music, it received rave reviews from print press like iDJ, DJMag and M8, and websites like Data Transmission, lauded for its consistency, diversity and programming. It showed the world that he wasn't just another producer of disposable 12" releases, but a real musician with something more to offer. The duo have now been asked to provide GU's first ever producer samples DVD for Loopmasters, joining the likes of Marshall Jefferson and Todd Terry in the sample company's roster. Global Underground also invited Anil and Dale to compile and mix a special Classics CD to feature on their renowned GU: Mixed compilation series, and GU took him around the world on tours to Argentina, Peru and Guatemala (on his headline tour of South America), to Dubai, Miami, Egypt, Amsterdam, Ukraine and across the UK. That's not to mention his separate appearances at Pete Tong's Wonderland in Ibiza and in countries including Russia, USA, Spain, India, Netherlands, Lithuania, Georgia, Austria, Poland, Sweden, Italy and the Channel Islands. 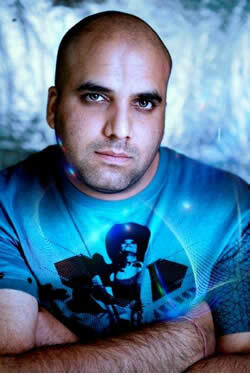 His talent has been recognised in multiple global dance music awards, including a nomination for DJMag's Best Breakthrough DJ of 2008 in their Best Of British Awards, a Mixmag Future Hero spot, a Best Artist nomination in the 2008 Beatport Awards, and an award for Best Deep House Track (for Leftorium with Dale Anderson) in the same awards. He was also shortlisted for Radio 1's ‘In New DJs We Trust' roster, a post narrowly missed out on and currently occupied by the likes of Heidi, Alex Metric and Toddla T.
His GU tour residency continues, with slots supporting the likes of Sasha, James Lavelle, and Felix da Housecat, and other recent highlights at home including his ongoing appearances at the awesome South West Four festival, a support show for Deadmau5, and of course a pivotal role in the infamous Turnmills closing weekend. Looking to the future, the recently-launched D.A.T. Soundsystem project with Dale Anderson and Tim Davison has seen him expand his DJing activities, playing 6 hour sets with his colleagues at The Ministry of Sound in London, while his productions continue to gain support from the likes of John Digweed, Pete Tong, Laurent Garnier, Hernan Cattaneo, Steve Angello and Nic Fanciulli - with everything from deep melodic funk and freaky acid house still all part of his repertoire. A forthcoming D.A.T. EP trilogy on Nick Warren's Hope Recordings alongside new bits for Cr2, Berwick Street, Presslab, Flow Vinly and Star 69, and more singles from Roadhouse will ensure that his name carries on being on the house music cognoscenti's lips through into the new decade.